So Essen has come and gone. And I didn't get to go--but enough whining! Kingdom of Solomon had a very nice debut. From the pictures and personal accounts it looked like the demo table saw non-stop action (and with people waiting). Sales were acceptable-to-good, and the game made #15 on the Medium Traffic column of GeekBuzz! Not too shabby with all the fierce competition and fatter marketing budgets at the show. The next stage involves snagging some reviews followed by US distribution. The boat will soon be on it's way, so we're looking at only a few short weeks before the first US copies make it over--including mine! Kickstarters will be first in line once our ship comes in. 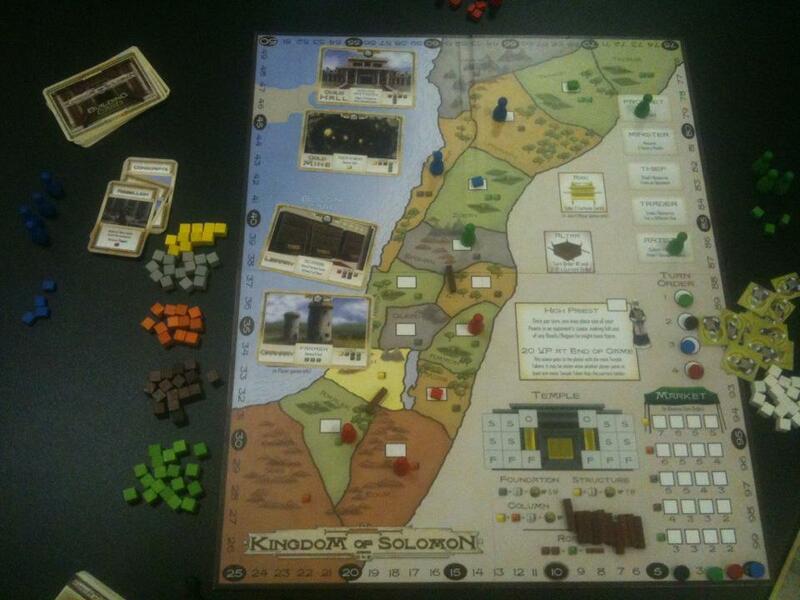 If you got a copy at Essen, we need you to rate it and maybe write a brief review or session report on BGG. Every little bit helps! One final note today. The final version seems to contain only 10 of the 16 Temple Tokens that ideally should be in there. They did put in 16 white cubes (Temple Blocks) to track the progress of the Temple, but we don't have 16 of the tokens (featuring the High Priest). This really does not affect the game much at all--many games will not even require all 16 tokens, as players often chose the VPs over the token. Even so, we apologize for this oversight. See the ongoing BGG thread for more info. Since it will be impossible for us to provide extras at this time, this leaves you with a few options. You can simply limit the tokens to 10. Or you can use tokens from another game, pennies, etc. Or you can print a few more using this high-res official PDF. My preference and intention was and is to make 16 tokens available. Again, we are very sorry for any inconvenience this may cause. 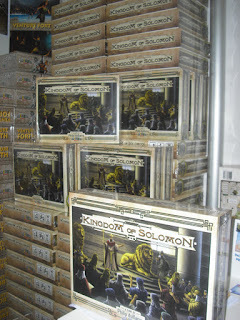 Thanks for your continuing interest in Kingdom of Solomon! We are looking forward to introducing more and more gamers to this great new experience. And look for even more new-game-related news coming in the next few months!